Votes for all 543 seats would be counted on May 23 after the end of the seven-phase polling. Election officials said voter turnout was high at most places, while poll-related violence saw the death of two persons in Andhra Pradesh and complaints poured in from various states about glitches in electronic voting machines and of names missing from the voter lists. 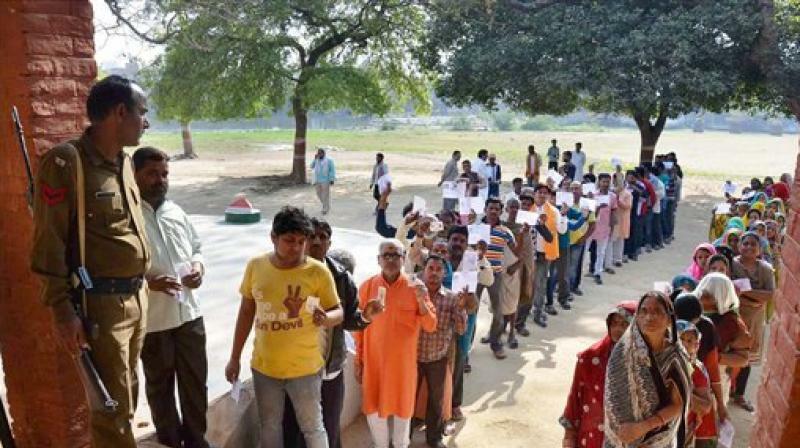 The 91 Lok Sabha constituencies in the first phase, spread across 18 states and two union territories, have more than 14 crore voters -- about one-sixth of nearly 90 crore total electorate in India. An estimated 1.5 crore young voters in the age group of 18-19 years would vote for the first time across the seven phases. In the last general elections in 2014, more than 55 crore Indians had voted (66.3 per cent) with the BJP emerging victorious with little over 30 per cent votes, giving a five-year mandate to a government led by Prime Minister Narendra Modi. Voting also took place in 175 Assembly seats in Andhra Pradesh, 32 in Sikkim, 57 in Arunachal Pradesh and 28 in Odisha. Besides, eight seats in Uttar Pradesh, seven in Maharashtra, five in Assam, four each in Bihar and Odisha, two each in Jammu and Kashmir and West Bengal and one seat in Chhattisgarh are also part of the first-phase. These states have multi-phase voting. Election officials put the voting percentage till early afternoon at 40 to 50 in most states. Prime Minister Narendra Modi is seeking another term in power, focusing his election campaign on national security and flagship schemes. The Congress has promised to roll out a minimum income scheme, named 'Nyay', to provide a minimum basic income of Rs 72,000 a year for three years to the poorest strata. Congress under Rahul Gandhi has been relentlessly targeting the Modi government and has also accused it of corruption. Gandhi said Thursday in Rae Bareli after his mother Sonia Gandhi filed nomination papers that the election results would prove that Modi is "not invincible". The Prime Minister, at an election rally in Bihar, asserted the Opposition was scared that if he came back to power, their "shops" of corruption and dynasty politics would shut down. In Andhra Pradesh, anti-incumbency, caste and corruption were the major factors that could determine the outcome of the elections to Lok Sabha and the state Assembly. The state has 3.93 crore voters and this is the first general election there after bifurcation of the erstwhile Andhra Pradesh in 2014. There are 2,118 candidates for the state polls and 319 for the Lok Sabha elections there. TDP chief and Chief Minister N Chandrababu Naidu was seeking election from Kuppam, while his son Nara Lokesh made his electoral debut from Mangalagiri. YSR Congress chief Y S Jaganmohan Reddy, an aspirant for the CM's post, is fighting from his family's pocket borough Pulivendula. In 2014, the TDP won 101, YSRC 68 and BJP four. In Lok Sabha polls, the TDP had bagged 15, YSRC eight and BJP two. In Telangana, the ruling TRS is hoping for an encore in Lok Sabha polls after sweeping the December assembly elections, while both Congress and BJP are looking to increase their respective tallies. There are 443 candidates in the fray for 17 Lok Sabha seats from the state. In Uttar Pradesh, BJP is facing the newly-formed SP-BSP-RLD alliance. In Muzaffarnagar, RLD chief Ajit Singh will take on BJP's Sanjeev Balyan, while his son Jayant Chaudhary is pitted against Union minister Satyapal Singh in Baghpat. In Maharashtra, Union Minister Gadkari faces Congress's Nana Patole, a former BJP MP in Nagpur, while his party colleague Hansaraj Ahir is seeking a fourth term from Chandrapur. In Bihar, LJP leader Chirag Paswan is contesting from Jamui against Bhudeo Chaudhary of RLSP. In the North East, Union Minister Rijiju is seeking re-election from Arunachal West. In Assam, former CM Tarun Gogoi's son Gaurav is in the fray in Kaliabor. In Chhattisgarh's Bastar, security has been tightened following a naxal attack in the constituency's Dantewada area on Tuesday. A BJP leader and four security personnel were killed.